-- Select a Size/Color -- Small Medium - Out of Stock! The Playin' It Cool Sunglasses Emoji Faballs Dog Toy will bouncy and squeak into your millennial pups heart!! 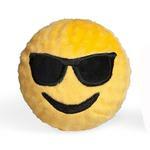 This Playin' It Cool Sunglasses Emoji will give your dog hours of hip fun from the Emoji Faballs Dog Toy. TPR Squeaker ball with nubs under a soft cotton fabric and embroidered face. Great for fetch and soothing gums! Spot clean with water. Posted On 03/27/19 by Korena S from King City, OR Yes, Korena S recommends this product! Perfect for summer. My pup loves these balls!!! Lots of high quality products, all of which have great prices. The shirts I ordered are really nice.